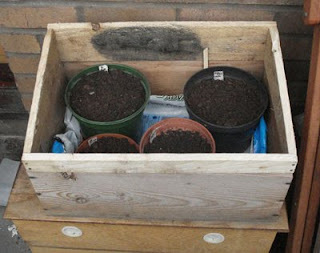 In my ongoing quest to reduce food miles by growing more greenery I have spent an hour or so building a small cold frame for the balcony. It's not quite finished yet (I have a huge piece of clear polycarbonate that I need to saw into pieces so I can use part of it for the cold frame top), but the frame itself now exists. The best bit is that it's made from 100% reclaimed bits. 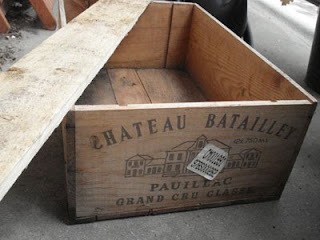 The base is a wine box that I got from my parents (sadly by the time it reached me it was empty of wine). 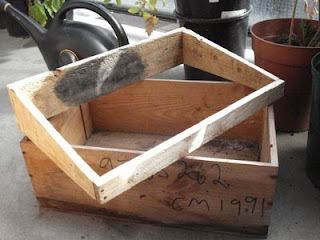 The part of the top that gives it a slope (so it'll catch the sun better) is made from planks reclaimed from a pallet. The pallet was part of a very small pile of wood left after Climate Camp, part of which I took home*. I saved the nails as I took them out when dismantling the pallet, and enough of them were straightish that I could use them for this project. The measuring, sawing to size (including sawing the diagonals), and nailing together took under an hour: much quicker than I'd expected. The picture shows it on the balcony in its temporary "on top of the wormery" location. (I need to rearrange the balcony space a bit.) The pots have rocket and bronze arrowhead lettuce seeds in: the hope is that the cold frame will keep the plants going over the winter & I'll be able to keep having salads. We shall see!